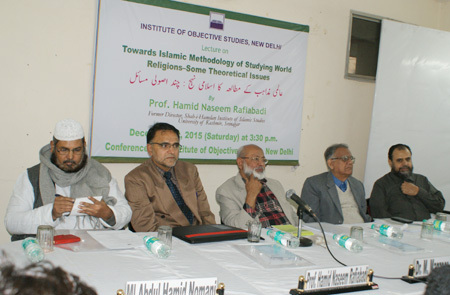 A lecture on “Towards Islamic Methodology of Studying World Religions - Some Theoretical Issues” was organised by the Institute of Objective Studies at its Conference hall on December 12, 2015. 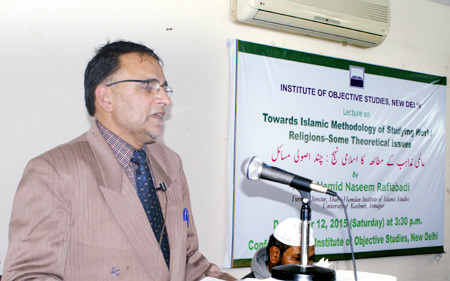 Delivering the lecture, Prof. Hamid Naseem Rafiabadi, former director, Shah-i-Hamdan Institute of Islamic Studies, University of Kashmir, Srinagar observed that the phenomenon of religion had attracted the attention of intellectuals and thinkers from the distant past to the present times. Owing to its presence everywhere, intellectuals from various fields of life arose to search for the origin, nature and function of religion in human life. He said that in the course of its history, religion had caught the attention of various academic disciplines, studied by anthropology, sociology, psychology, science, political science, theoretical economics and philosophy. He noted that it was during the 18th and 19th centuries when some important intellectual developments took place and the scientific method accompanied by a wealth of material on religious phenomenon penetrated into the West that the various religious theorists presented their respective theories of religion. He said that the early interpreters of religion theorised that religion was the result of rational effort to comprehend the basic question of existence. The first prominent interpreter among them was EB Taylor (1832-1917), who, surveying through the mass of material on primitives that was pouring into Europe during the 19th century, concluded that religion originated as primitives used their child-like reasoning to answer certain problems. Prof. Rafiabadi said that the next important figure in formulating the theory of religion was James Frazer (1854-1941) who held that religion was the offspring of primitive magic and arose out of what he called as “homeopathic” or “sympathetic magic”’ that associated acts through similarly. According to Frazer, in magic man depended on his own strength to meet the difficulties and dangers that beset him on every side. He believed in a certain established order of nature on which he could surely count, and which he could manipulate for his ends. He observed that the first prominent psychologist who attracted world attention was William James (1842-1910). According to James, religion necessarily contained two factors: an uneasiness and its solution. He said that the uneasiness was an awareness of the fact that there was something wrong about our present state. The solution consisted in the realisation that we could win over this uneasiness by establishing a proper relationship with a higher power. He said that Sigmund Freud (1856-1939) viewed religion as originating in the child’s relationship with his father. Hence, in many cultures, God was viewed as a “heavenly father”. Rudolf Otto (1869-1937) found religion arising from a source lying in the deepest recesses of the human soul that was independent of ordinary senses. According to Emile Durkheim (1858-1917), religious phenomenon emerged in any society only when a separation was made between the sphere of the profane-the realm of everyday utilitarian activities and the sphere of the sacred–the area that pertained to the numinous, the transcendental, the extraordinary. Another philosopher, Max Weber (1864-1920) viewed religion strictly in the scientific sense, attempting to ignore value judgments by understanding it as those human responses that gave meaning to the inescapable problems of existence, such as birth, death, illness, aging, injustice, tragedy and suffering, he said. Prof. Rafiabadi pointed out that Islam saw religion as a link between men and the ultimate reality of God. Such a bond was never absent in any period of human history. The prophets in every age of humanity rose to strengthen such a bond between mankind and their Creator. The role of these prophets was to keep the men on their true nature where they might not degenerate into polytheistic and superstitious beliefs after acknowledging the supremacy of one supreme deity, i.e., God (tawheed). He said that Islam saw religions consciousness as an indispensable part of human mind that might be strengthened by the external world but not entirely stimulated by it. He said that the evolution of religions might not be termed as something of the transformation of polytheism into monotheism or the gradual growth of the idea of God, but as the gradual understanding of divine attributes unfolding with each passing phase of human history. While the concept of God was one and the same right from the beginning, the Shariah (rules and regulations) was different for different prophets only to suit the needs of the community they were sent for. Islam safeguarded the essence of the religion revealed to all other preceding prophets, he said. Prof. Rafiabadi noted that religion continued to be studied with full zeal and enthusiasm. Prophetic history was in reality the history of Divine Guidance for mankind through the mission of prophets and messengers. Since the prophets came with a divinely-ordained knowledge and guidance, it contained the message of purity – Unity of God (monotheism) and the unity of mankind. The Quran declared all the prophets and all men of faith forming one family. Islam called itself universal and dated from Adam. Islam pointed out the unity of message in all ages for each community and stated that in the beginning all men were of one religion and later they fell to variance, he said. He argued that Islam had preserved the essence of religion, i.e., belief in One Supreme Creator in its pristine beauty. The ruminants of monotheism wherever seen in the cultures and religions of the world, testified that Islam rightly confirmed, endorsed and preserved whatever was the part of the primordial faith of humanity. The Islamic perspective on religion offered fresh inquiries and insights into the theories of religion, he added. 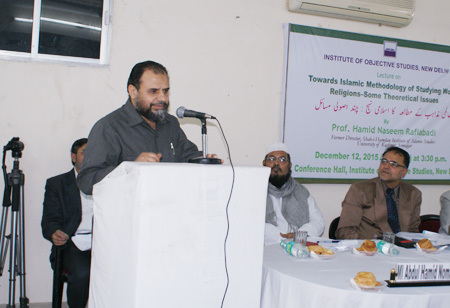 Noted Islamic scholar and the Secretary, Jamiat-i-Ulma-i-Hind, Maulana Abdul Hameed Nomani, opined that while the Islamic view was based on principles and faith, other religions viewed society as the basis for their hypothesis about religion. Citing an example, he said that in the majority society, whether one believed in one god or 33 crore gods or disbelieved both of them, would be treated as its part. As against this, if any Muslim refused to accept the Prophet (SW) as the last prophet, would not be treated as a part of Islam, he said. Truth stayed where there was no room for escape from good. Explaining the thesis that Islam was true, he said that Prophet Christ, Prophet Moses, Ram, Krishna, Mahavir, Buddha, etc; formed part of Islam. From that point of view, Islam was complete in all respects and salvation was possible only by following Prophet Muhammad (SW), he concluded. Secretary General, IOS, Prof. ZM Khan remarked that Prof. Rafiabadi’s talk centered around the Western concept of religion whereas no narrative would be complete without taking Islamic perspective of religion into account. Describing the scope of the topic as wide, no definitive conclusion could be drawn without engaging with Islamic scholars. Chairman, IOS, Dr. M. Manzoor Alam, in his presidential remarks, explained that Islamic faith was complete and no addition to it could be made. However, there was room for exploration (Ijtihad) in social sphere, but not in prayer. Referring to the advancement of science and technology, he said that the use of mobile phone was the source of knowledge as also the genesis of degeneration. Elaborating further, he said that currently, 36 percent of the population in the age group of 9 to 12 years was engaged in accessing pornographic sites. Besides, 45-50 percent population in the age group above 13 years viewed adult films. He questioned the utility of such an internet and said that what was important was intellectual content. 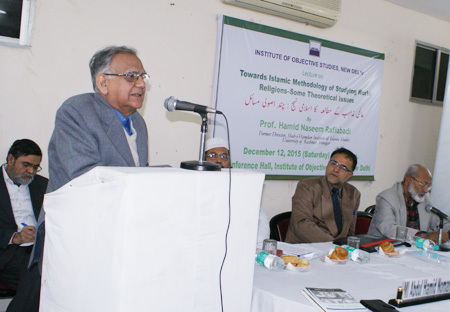 He asked scholars to study religion in Islamic perspective. Commenting on a Qur’anic verse “Thou art the best group”, he said that this had been part of our glorious history. But this was for “linnas” (humanity) so that we could save humanity. He observed that the need for saving humanity today was more than ever before. 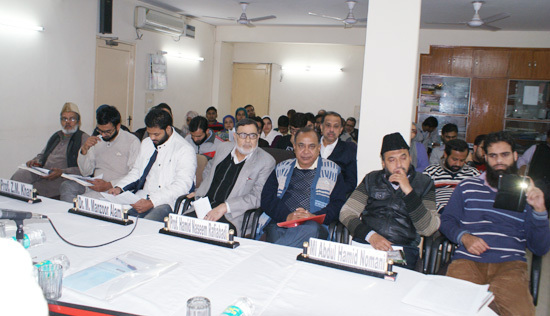 Assistant Secretary General, IOS, Prof. M Afzal Wani held that the methodology of religion as suggested by the Quran was complete and we should stick to it. The lecture was followed by a question-answer session. A prayer was also offered for the wife of the Vice-Chairman, IOS, Prof. Refaqat Ali Khan and for the brother and sister of the Finance Secretary, IOS, Prof. Ishtiyaq Danish, who died recently. 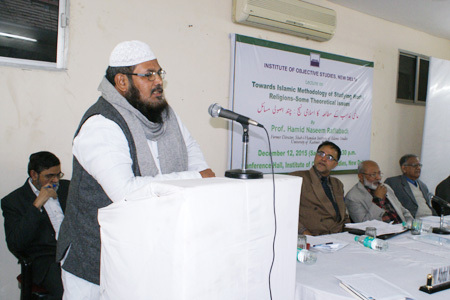 The lecture began with the recitation of a verse from the holy Qur’an, by Hafiz Athar Husain Nadvi. 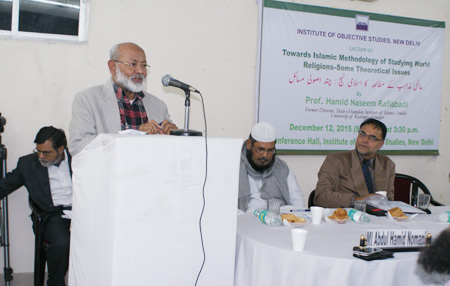 Dr. Nakhat Husain Nadwi conducted the proceedings. Prominent among the attendees included Mohsin Maqbool, Mohsin Javed, Mohammad Tanzeem Alam, Muneeb Faiq, Khalid Mohammad Tabish, Khairunnisa Aga, Zubair Arif, Mohammad Nadeem Bukhari, Mohammad Mushtaq, Syed Mehdi Hussain, Advocate, S. Haji Sahabudeen, Sabir Akhtar, Md. Zeeshan, Zahoor Ahmad Bhat, Safi Akhtar etc.